A flood scheme for Queen’s Square in Huddersfield has been installed thanks to money from the DEFRA Property Flood Protection Grant Scheme. On behalf of the home-owners in Queen’s Square, Kirklees Council applied to the scheme which gives local authorities the chance to apply for funding to identify measures for individual properties in areas where there is frequent flooding and where other larger scale solutions are not economically or technically viable. Kirklees Council applied for the grant for four homes at Queen’s Square as they had suffered internal flooding twice in the last ten years and had not benefited from any community defence scheme as nearby estates had. The flood protection products installed were door guards and air brick covers supplied by Floodguards which slot into place when required. The products are independently tested and conform to British Standards. As well as having the flood defence work done, all the property owners have signed up for the Environment Agency’s flood warning system, Flood Warnings Direct, which is available free to people in at risk areas. This can be accessed via the Environment Agency’s website, http://www.environment-agency.gov.uk/flood, or by calling Floodline on 0845 988 1188. Kirklees Council’s Flood Management Team and the Environment Agency have encouraged volunteers among the residents to become Flood Wardens. The wardens will help residents develop flood actions plans detailing how they will work together to respond as quickly and efficiently as possible in a flood. This will include making sure all the flood products are installed when a warning is received. The wardens also act as the Environment Agency’s eyes and ears on the ground with a direct line to the Area Incident Room providing information on rising water levels. Queen’s Square resident Fiona Fraser, said: “The fittings that are on the outside of the property are not in any way obtrusive and do not look out of place. The workmanship was excellent and the products make me feel a lot safer and more confident if the river does flood again or the drains come up due to heavy rain. I did have the opportunity not long after the products were installed to use them and was amazed how easy they were to fit. Each of the four houses helped each other, but luckily the river did not flood on this occasion, but we all felt safer with them on. 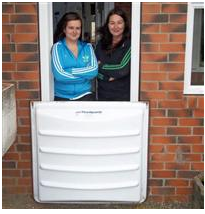 Queens Square residents Hannah and Mary Fox are pictured showing off their new flood defences.